Link Light Rail has two tunneled sections: One is the existing Downtown Seattle Transit Tunnel, currently being retrofitted, and the other are double tunnels under Beacon Hill. Beacon Hill Station will be over 165 feet below ground, between Mount Baker and SODO stations. Expected to have nearly a million boardings a year in 2020, it will provide commercial and residential growth for Beacon Hill, and will result in better air quality and better traffic as more people choose it over private vehicles. While the Rainier Valley segment of the light rail could have been bypassed on the way to the airport, this area of Seattle has been lacking development dollars for decades, and fixed guideway transit brings developers to station locations. For this alignment, in order to both access the operations and maintenance base nearby the Port and to serve the stadia, and to avoid putting surface level tracks on Rainier Boulevard, a tunnel under Beacon Hill was necessary. The station will begin at ground level at Beacon and McClellan, and extend downward about 180 feet. To begin, the walls of the shaft were cut out and built in place in 12 foot wide sections. 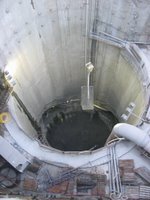 As each section is sunk, the hole made is filled with a high density liquid called "slurry" that supports the surrounding earth, preventing a collapse in the 180 foot deep holes. The slurry is then displaced by concrete from the bottom up, and this is allowed to harden before moving on to the next section. The walls of the station shaft were completed before any dirt was removed from inside of them! 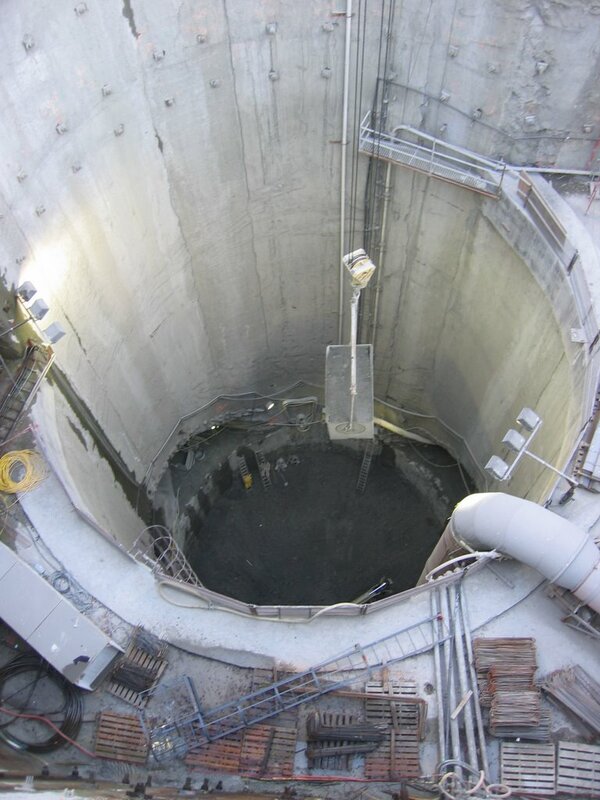 This dirt is mined out from the surface, with workers lowered by crane into the main shaft as the depth increases. The crane also removes earth from the excavated station with what's called a muck bucket, filled by earthmovers at the bottom of the excavation. A second shaft with emergency stairs and ventilation will also be sunk between the platforms just to the east of the main station. Air will largely be circulated by the movement of the trains themselves, but I've been told that this system helps maintain more constant air pressure for passengers at the station. Tunneling was originally to begin in October of last year, but was delayed due to sandy soil near the station site. Apparently, this has little impact on the tunneling itself, but excavation of the station platforms had to wait for what's called "jet grouting" to take place. Jet grouting involves drilling a hole straight down from the surface, then filling it with a concrete-like substance in order to stabilize the soil for excavation. This was included as a provision in the contract with Obayashi, and it saved Sound Transit and the taxpayers a considerable amount of money to have it available. The tunnel boring machine (TBM), now known as the "Emerald Mole", will start at the west portal under I-5, near the new Operations and Maintenance facility, and bore the two tunnels one at a time. After the first tunnel, it will be brought back around to the west portal to begin again, in order to keep all the earth coming from one source and traveling on one route. As it moves, the TBM actually builds the tunnel inside its skin from these large precast concrete sections, then pushes forward off of them to drill out the next section of earth. A concrete grout fills the slim section between the tunnel liner segments and the outside of the bored tunnel. Yesterday morning marked the official launch of the Emerald Mole, with elected officials such as Senator Patty Murray, Seattle Mayor Greg Nickels, and King County Council Chair Larry Phillips, with representatives from the offices of several others. 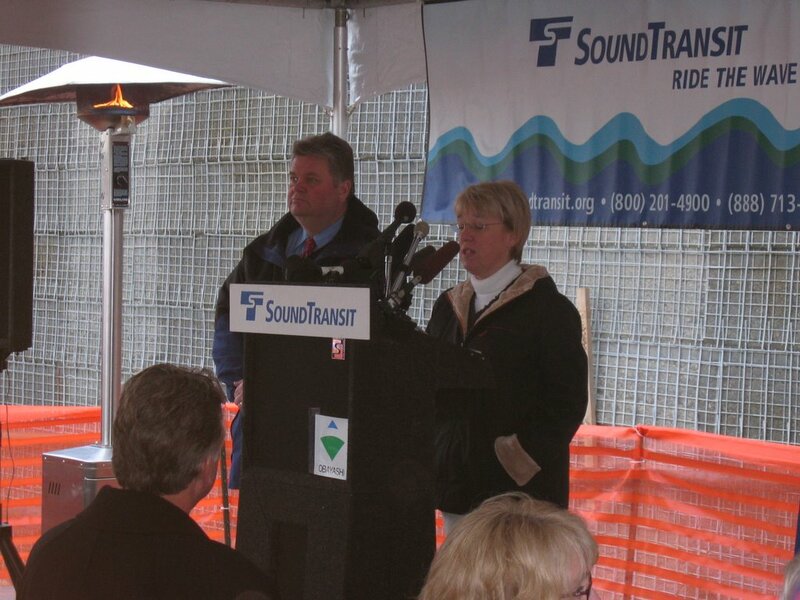 Much of the Sound Transit staff also came out, as well as contractor personnel such as Paul Zick from Obayashi. 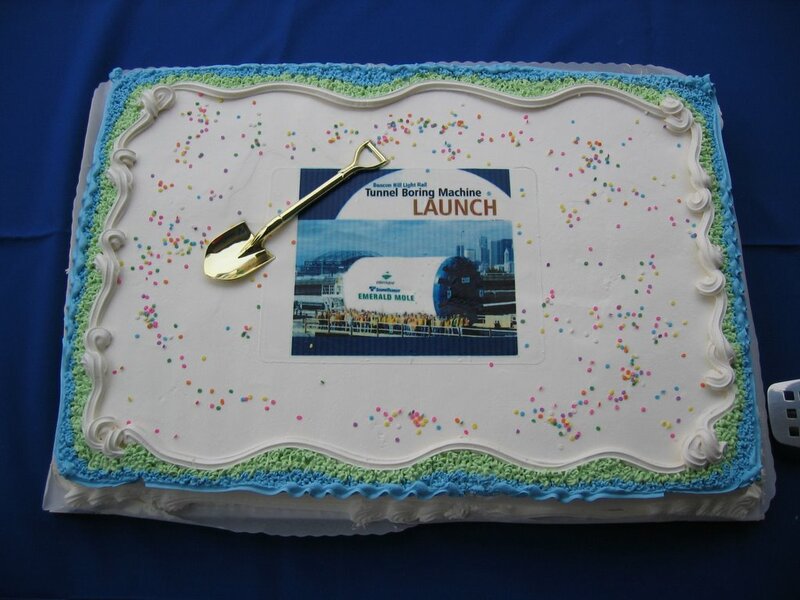 They had cakes from Obayashi featuring Sound Transit colors and logos, as well as coffee provided by Tully's, who are headquartered next door. Murray and Nickels each gave short speeches, and gave recognition to a number of individuals who came out for the ceremony. The VIPs went up to break bottles of champagne and sake against the TBM, and everyone got a chance to sign the side and ask questions about the machine and the process - I learned a lot about the equipment and the process. Congratulations to Sound Transit for a crucial milestone on the path to completing Link! Good to see that drilling is now underway, we need more LRT lines built, and cannot do that until the spine is running, and this is the biggest obstacle to getting the current line running. LINK COnstruction on both sides of the hill has been underway for 1-2 years and may finish before mid-2008. Yay! I'm glad to see I didn't lose you - sorry it's been so long, work has been hell. We will be done on schedule - I'm hoping ahead of schedule. The FTA rep at the launch said they were quite far under budget, too. I wonder if Stefan Sharkansky, Tim Eyman, Dori Monson, John Niles, Maggie Fimia, Emory Bundy and other Sound Transit Critics were invited. Would have been a great oppurtunity to have the record set straight by the FTA Rep. I think the fact that Sound Transit is one of the few LRT Projects to get a Highly-Recomended Rating from the FTA proves that the FTA is sure that Sound Transit is doing a good job. I was not invited to the kickoff celebration of the "Little Dig" under Beacon Hill. With great coverage by Ben et al, I don't feel I missed too much. In one sense digging this Beacon Hill tunnel is a practice event for the planned light rail five mile "Big Dig" from downtown Seattle to NE 75th Street, which will put over 100 thousand dump trucks of dirt moving on the streets of Seattle. Let's watch carefully how this dirt moving works over the next few years with the Beacon Hill spoils. The planned light rail Big Dig under Capitol Hill using two "Emerald Moles" simultaneously will consume more energy to build than will be saved by eight decades of folks parking their SUVs and riding the train, according to the draft Environmental Impact Statement. Coalition for Effective Transportation Alternatives (CETA) supports the wide geographic coverage offered by energy-efficient, appropriately-sized buses going to many places, rather than feeding patrons to a single, mega-expensive, dangerous, slow, right-of-way-wasting light rail "spine" like Central Link. I'm just back from DC where I learned that The New Starts rating process is in the process of being tightened up (again) by FTA under pressure from Congress. I also learned that the Congressional General Accountability Office (GAO) is very aware of the problems in alternatives analysis carried out by railroad boosters who have yet to meet a train they don't like. Case in point, Seattle's "light" rail coming in with a BART-like "heavy" rail price tag. The Capitol Hill Big Dig has several more years of being scrutinized by FTA before a final rating is made and the necessary $700 million construction grant is awarded. I disagree with many of John Niles' comments. I suppose he can label the Beacon Hill tunnel a "practice dig" for the Capitol Hill tunnel, if he wishes, but the word "practice" suggests it's not so important in and of itself. I live on Beacon Hill, and I can assure everyone that this tunnel is a key element to the success of Link's initial segment. John found a very large number in some ST documentation about the number of dumptruckloads of spoils that will emerge from the Capitol Hill tunnel over a number of years. Divided out by the hours the tunnel boring machines will be working, however, and it's just a handful per hour -- hardly the sea of dumptrucks he would like us to envision. And my goodness, it will take 80 years to "save" the energy it will take to build the CH tunnel? Since when did we start building transportation facilities in order to "save" energy? It took an enormous amount of energy to build I-90 between downtown Seattle and Bellevue. How long will it take to "save" that energy back to the community? Like maybe never? John still dreams of the all-bus alternative that would provide an equivalent level of speed, capacity, reliability, and comfort as Link light rail. Trouble is, to accomplish this (approximate is a better word) would take 24/7 bus/HOV lanes, proper stations, etc., driving costs right up there with Link light rail. Or put another way, there's no free lunch. The only way to get an all-bus alternative to pencil better than Link is to operate on existing pavement and pretend it's providing equivalent speed, capacity, etc. And remember, Link is essentially a 100-year system. An all-bus “alternative”, even if it could be made to operate satisfactorily in its early years, would fail to keep up in the out years. Yes, I'll concede John one point -- Link light rail does come with a heavy price tag, "BART-like" as he suggests. Two perfectly obvious reasons for this, however. First, so much of the Link ROW is grade-separated, like BART, where it can operate at top speed and closer headways. And second, because we have no abandoned rail ROW that could be acquired on the cheap, like most other newer LRT systems did around North America. We had to go out, in a built-up city with expensive real estate, and buy and build our own ROW. I doubt the Feds will blink at the cost for the CH-University extension because the ridership in the North Link corridor is so enormous. In fact Central Link is destined to have the highest ridership of any light rail line built in the last 25 years. On a capital-cost-per-rider-served (if there is such a factor) it will be way low -- fully justifying the community's investment. I was just by the Mt. Baker Station Construction site, and there is a temporary inconvenience for me. It is hard to get into Grocery Outlet(They have cheap vitamins), but it is only temporary. I knew it was only a matter of time, but it will only be temporary, construction in this area has been underway for over a year. Sure there are potholes on MLK Jr. Way because of construction, and the city may even fill them, but you have to tell them, not complain to the newspapers! I was riding the 48 bus tonight, and noticed some stretches of MLK Jr. Way are being prepared for widening, as the 4 existing lanes will be preserved. Also, I wonder, could the dirt from a Capitol Hill Tunnel be dried out, and re-used, say to help coastal beaches facing erosion, or give Lake Washington a better beach? I would like to have seen the Burke-Gillman Trail have been kept a rail line between Husky Stadium and the BNSF main, for traffic-mittigation for Husky Games. It may not make a good rail line North of the Stadium towards Lake City because of the curves. I saw a picture in a book about Washington Transportation History(it's available for purchase on HistoryLINK.org) of what the original proposal for I-90 would have looked like. They wanted to completely severe the hill above the Freeway, make it a cut, it would have been about 12 lanes, plus the existing 4-lane bridge. That would have been a big waste. The HOV Lanes are supposed to be able to be converted for LRT use. CentralLINK will use 1500 Volts in the overhead lines, Portland MAX and Seattle's Trackless Trolleybuses use 600 volts, and BART uses 1000 voltes, in comparison. Perhaps it is to use fewer substations, perhaps it is that they need the extra power to handle the elevated portions. If Beacon Hill is a dress rehearsal for Capitol Hill, perhaps they should try to re-use the mole? MLK Jr. Way needs to be fixed up, and slowed down. Just because it is SR900, does not mean motorists should be driving down on it like it was the Valley Freeway. I also disagree about the importance of digging this tunnel. Having an operational segment will likely improve voter interest and confidence in further transit projects, something we desperately need now that the monorail is defunct. Also, John, what happens to buses when fuel goes up in price? What happens to our electric light rail, given that in Seattle, it would be powered with renewable energy? In fact, Electric Transit in Seattle, for most of the 100+ years of it, has always been fueled by renewable energy, in fact, it is being renewed right now! Diesel Fuel is already above $2.50 per gallon in the Seattle area, Metro also uses B5 in the Diesel Fleet. I am not sure about the Hybrids. One report says that the 236 Metro uses are not getting the promised fuel economy, while another more detailed study says the opposite. TriMet in Portland, MUNI in San Francisco and a few other systems have hiked fares over the past couple months, fuel prices are the reason they cited. 80ft has been mined and 10 permanent rings shoring it up, that is now a major chunk of the 400ft of initial mining. Who knows what will happen when they get up to 50ft per day. The above comment was mine, I forgot to log in first. A few comments up, Roger Pence of Sound Transit shows again that he is an articulate defender of the plan to build Link Light Rail. He always makes the best case possible. However, Coalition for Effective Transportation Alternatives (CETA) disagrees with the overall direction of rail transit development that has been set by his employer. There is another way to go, that would provide much more transit bang for the buck, and yield more transit value from the ubiquitous and necessary road system that already goes in front of every structure and destination in the region. I agree with Roger that we don't build transportation facilities to save energy, but it is reasonable to consider the energy consumption and greenhouse gas implications of the choices we make about which modes to build. It's called "alternatives analysis" and it is an area where Sound Transit puts its hands on the scales. The energy consumption and greenhouse gas emissions from building a five mile light rail tunnel don't pencil out in an alternatives analysis against an all-bus alternative that could be crafted by transit planners who would be actually trying to make buses work as a complete system in this region, instead of relegation to RR feeder status. Link Light Rail costs too much and does too little. Buses providing one of the highest transit market shares in America are gradually being subsumed by Sound Transit's philosophy to second class status in the Puget Sound region. Answering Roger, I counter that an all-bus alternative **system** that would provide an equivalent level of speed, capacity, reliability, and comfort as a Link light rail **system** is an unreasonable design goal. 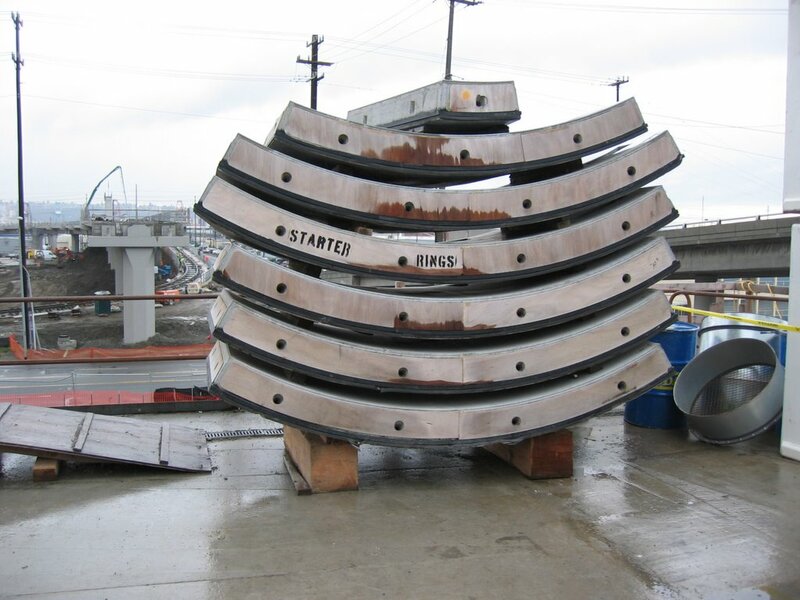 The design limitation of RRs is that fewer places can be served because of the cost and limiting characteristics of steel tracks. The design goal for a bus alternative system compared to a set of light rail segments is faster deployment, wider geographic coverage, more transit ridership attraction, more cost-effective mobility, flexibilty to make changes, and efficient use of existing infrastructure. Even so, in some cases, the bus will beat the train for a quicker ride, such as the express bus from downtown Seattle to SeaTac Airport, because the bus does not wander through urban neighborhood like Airport Link will, and because road authorities like WSDOT and SeaTrans are getting better at keeping traffic flowing with a variety of technologies. Street right of way is better used in peak periods for buses than for parking. Some entire Seattle streets in peak period would be better used for transit and HOVs exclusively than for solo drivers and delivery trucks. Case in point, Third Ave downtown. Back to Roger: Link as a 100 year system? I suppose so. But recall the last attempt in the USA at building a 100-year system of urban electric railways created a system that in most places lasted about 50. There were more miles of electric railways in the early part of the 20th century than there are miles of Interstate Highway today. But the door-to-door mobility provided by cars and the flexibility of buses won out over street railroads and interurbans. The U.S. light rail renaissance of the past several decades has had an insignificant impact on mobility and access in most of the cities where it has been built. Following the defeat of King County Forward Thrust Heavy Rail in 1968 and 1970, the Seattle region was well on its way to building the best bus system in America before rail mania struck again in the 80s. Now we are ten years into a "Sound Move" RR construction program with very little to show except escalating transit costs and degradation of the bus system because of massive resource diversion to RR construction and operation. Sound Transit beat Sane Transit in the State Supreme Court for the right to take as long as necessary and spend as much as needed from the present tax rate to build urban rail transit. Still, the Sound Transit taxes will have to be doubled to complete light rail from Northgate to S 200th. The present tax revenue streams of Sound Transit and county bus systems could be redirected and coordinated to build a region-wide BRT system that is the envy of the world. (Sound Transit was not necessary to be created to build the bus facilities it is building.) We were quite far along with the bus tunnel and large fleets of electric buses and clean diesel hybrids. ST hurried to close the bus tunnel two years earlier than once planned to keep up momentum toward justifying the Big Dig to Northgate while the funding for Northgate Link is not yet possible. We are regressing with the likes of Sounder and Central Link, because so many readers of this fine blog think that a great city requires the sound of wheel squeal and "clickety clack." And by the way, the problems of pollution and excessive energy consumption by cars WILL be solved as time goes on. If you want to see symbolic energy waste, go up to Everett Station some evening and see the pair of powered-up Sounder trains sitting there all night.